NETWORK FINALS: There were no changes from the preliminary Saturday network ratings. CABLE HIGHLIGHTS: The NCAA TOURNAMENT Final Four games on TBS towered over the rest of TV on Saturday night, led by 3.25 for North Carolina vs. Syracuse, with 2.44 for Villanova vs. Oklahoma. In addition, the Turner networks repeated their practice of airing “homer” coverage of the games on their other networks, so TNT scored 0.66/0.49 for its slant, and Tru’s versions were at 0.20/0.17. 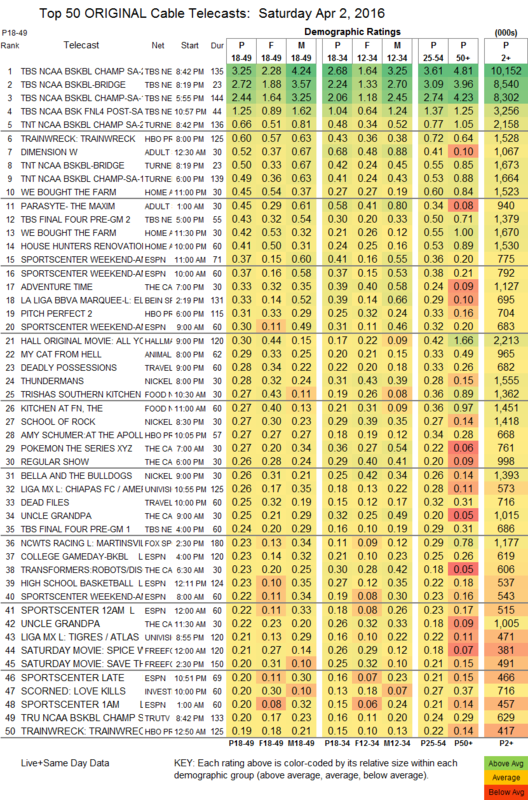 The strongest non-basketball “original” was Adult Swim’s DRAGON BALL Z, down 0.07 to 0.63/1.371M. The rest of the Adult Swim line-up: DIMENSION W down 0.07 to 0.52, PARASYTE down a tenth to 0.45, SAMURAI CHAMPLOO down 0.08 to 0.42/886K, NARUTO down 0.04 to 0.43/905K, ONE PIECE down 0.05 to 0.36/775K, and KILL LA KILL down 0.05 to 0.32/748K. HGTV’s WE BOUGHT THE FARM aired 2 episodes at 0.45/0.42, with lead-in HOUSE HUNTERS RENOVATION at 0.41. A Hallmark original movie ALL YOURS was at 0.30. On Food Network, TRISHA’S SOUTHERN KITCHEN was at 0.27, and KITCHEN AT FN ticked down to 0.27. Esquire’s BEOWULF held at 0.03/167K.